Get rid of the back strain and potential accidents! The Metal Plant Caddy provides you the convenience of sunning and shading the plant on the daily basis. The wheels will allow you to move the plant, bin, or whatever item on the caddy freely without scratching or damaging the floor. 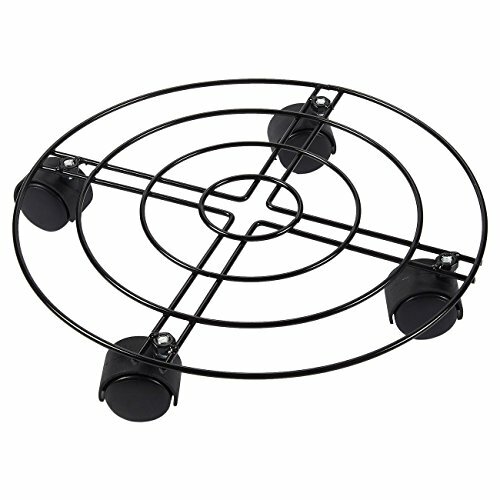 The iron frame is made of high quality material with rustproof black powder coating. The set comes with a small spanner for assembling and disassembling the caddy. The wheels cannot be locked. PLANT STAND WITH WHEELS: Includes a round iron top with four rolling wheels for easy transporting heavy flowerpots and plant pots. STRONG CONSTRUCTION: This plant caddy is constructed of sturdy iron frame with black powder coating for rust-resistant. The frame allows excess water to drip down the planter. PROTECT YOUR FLOOR: The wheels are designed to move in all directions smoothly and provide easy sliding on your hardwood, tile, stone flooring, and other flat surfaces without damaging them. The wheels cannot be locked. MULTI-PURPOSE: Place the plant trolly indoor, outdoor, garden, living room, dining room and other places with heavy flower pot, ceramic vase, potted tree, trash can, or other heavy items. A small spanner is provided for assembling and disassembling.